I have so far, been really impressed with Phase Zero Makeup, the quality has been superb and the prices are purse friendly. Having already reviewed the lipstick collection (here), the build your own Eyeshadow Palette (here) and the liquid eyeshadows (here) I really wasn't too sure how there could be anything better - then the Metallic Foils arrived and O.M.G!! The trend right now for metallic eyeshadows, lips and all thing sparkly is quite something and it seems every brand is wanting to cash in and be the best there is out there. 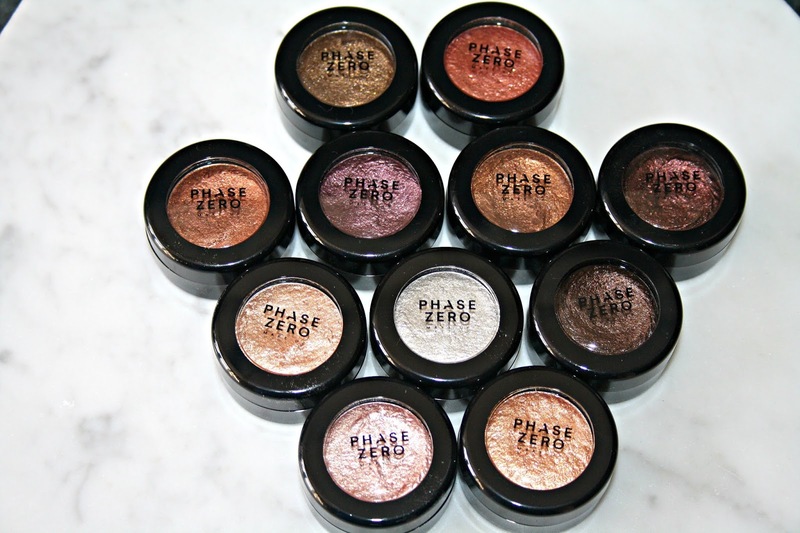 The in walks Phase Zero Makeup and honestly, these are some of the most pigmented shadows I have ever used! Arriving in little pots, I love that they are not on a palette and can be bought singularly or as a set, so you can choose which of the 15 shades work for you. I was sent 11 of the shades and here they are! 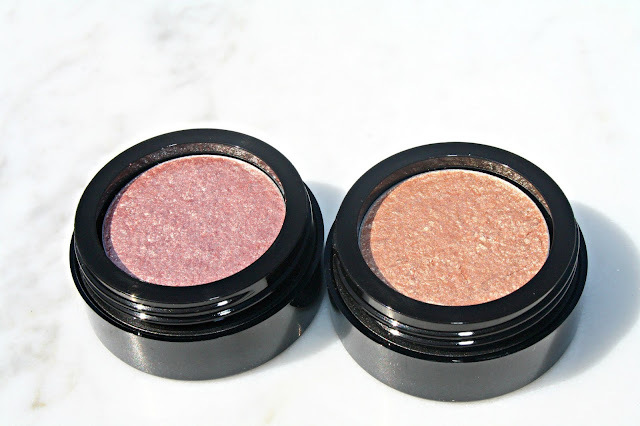 As you can see the pots, which hold 2g of the product have a see-through lid so you can helpfully see which shade it is you might want and the name of each is featured on the bottom. Twisting off the lid, which helps keeps the product at its best, the Metallic Foil has a wet to the touch feel to it and for me, it makes it much easier to apply. Ideal for using with your finger or even a flat shadow brush, these foils are so pigmented that it is a case of less is more. These swatches are unedited and they are just in direct sunlight, but each one is done with the slightest touch of my forefinger on the top of the shadow and then swiped quickly across my hand. Cigar is best described as being a neutral brown/bronze shade which has a great metallic pay-off. Godmother is best described as being a sparkling silver shade and this is the on shade that I wouldn't use on its own, but instead with another eyeshadow to add a bit of sparkle. Star Girl is best described as being a very mild yellow/gold shade with high-shine payoff and it is one of those shades which looks just incredible in the sunlight because it really does sparkle. Gold Roses is best described as the perfect rose gold shade and it is one of my favourite shades from the collection because it is just so wearable. 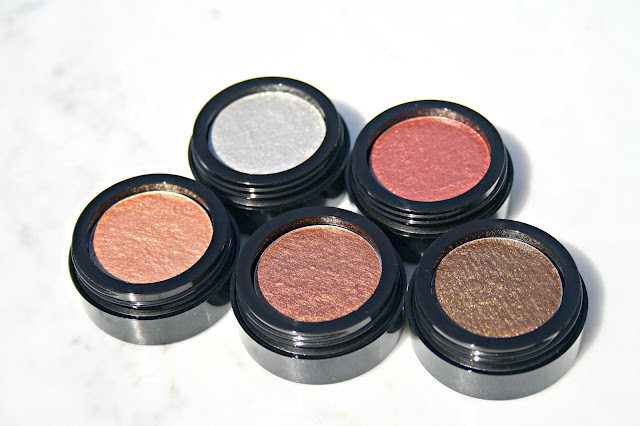 These shades are just incredible and what I like is that they can be used on their own, they can be used together and they can be used as a topper for any other shadow you might want to use. The next four shades, which are just as stunning are again all incredibly pigmented and as above, all swatched with just the lightest of touches. 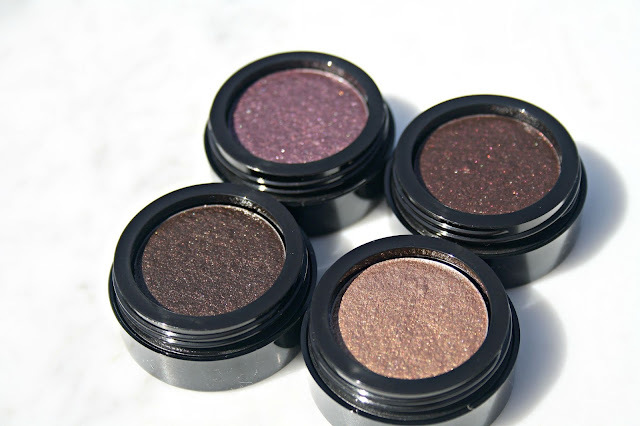 Goth Girl is a beautiful deep burgundy which again could be worn on its own or used to create a high drama smoky eye. Dark Knight is another of my favourite shades and it is a rich dark brown shade which has an incredible glitter pay off. Smudge also sits in with one of my favourite shades and it is one I have used quite a lot of. It is a deep golden brown shade which I find works well on its own without the need to use it with or over any other shade. 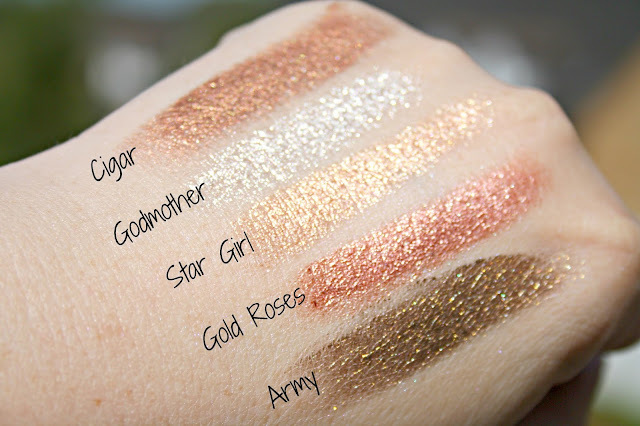 Again, all of these swatches have been taken outside in natural daylight and haven't been edited to change the shade. 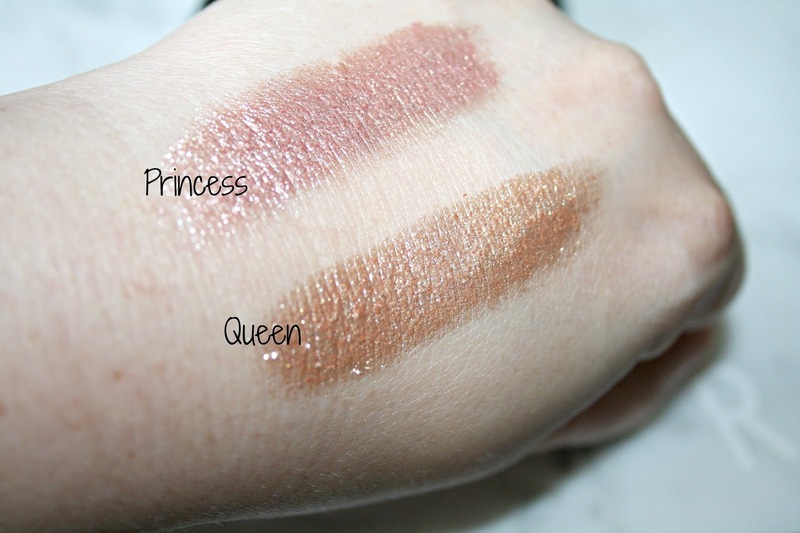 The final two shades from this collection I have are also quite something and if you like an eyeshadow which is on the lighter side but equally beautiful then here we have Princess and Queen. Again the swatches are done with fingertips and not edited and what I love about these two shades is how beautiful they are. Queen is a gorgeous light gold that delivers a touch of sparkle to your eye makeup and again it can be used on its own or with other shades. When it comes to applying these shadows, as mentioned they are quite wet, so you only need a small amount. I find that they apply best using fingers and then blended lightly with a brush. The shade with the most fall out for me so far has been Army, but less so when used with a shadow primer. Longevity with these shades differs, I've found one of the long lasting to be Gold Roses, it is a shade that once applied doesn't budge and it is there for most of the working day, only needing a top up if going out in the evening. Phase Zero is exclusively available to Love Me Beauty and it works in a similar way to the Beauty Box Subscription. So, for a £5 monthly membership fee, you as the subscriber gain access to the Phase Zero Makeup collection at those much-discounted prices. The brand promises that they will deliver high quality, cruelty-free makeup products that contain luxury formulas but instead of costing exorbitant amounts, you will instead get them at factory prices, for example, retail for £12 but members pay only £3.50. If you don't want to be tied into a contract, then you don't have to be, you can still buy the products for their RRP. If you have never tried Love Me Beauty before or want to try Phase Zero makeup for yourself then I have a unique code which will give everyone £5 off their first purchase and all you have to do is enter the code Rachel5 at the checkout, so essentially it is a free one month trial of what is on offer. If you do take advantage, I would love to know what you buy! I think these sound and look so gorgeous!! Wow!! These are absolutely amazing!! This brand has really surprised me! I think these are their best launch yet. These are really gorgeous. I love the look of princess. Oooh I want them all. I bet these are fun to play with. 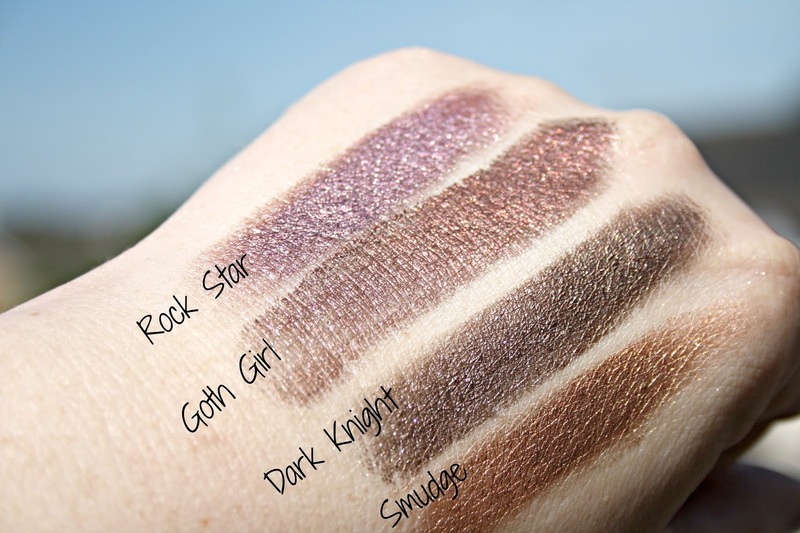 I'd love Star Girl and Cigar the most I think.. but Rock Star is a gorgeous shade and not one I'd usually go for. Lovely shades!Metallic colors is actually nice during night.